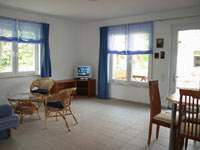 Roomy, stylish, comfortable interior are the right counterpart to the experience of nature throughout the whole year: Capricorn Holiday Apartments in the coastal resort Loddin/ Kölpensee on the island of Usedom. Spacious, bright rooms with cosy under-floor heating, comfortable furniture and high-quality fitted kitchen are just a few aspects, that ensure a comfortable and relaxing environment. 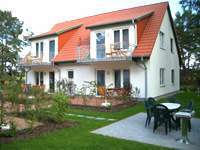 The partially canopied patio allows relaxation in the warmth of the sunniest German island Usedom and in the event of an unusually cloudy day you remain dry and comfortable. 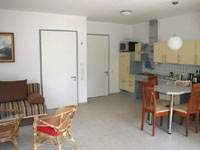 Parking space in the immediate vicinity of the apartments ensure, that your luggage and shopping don’t become a burden. 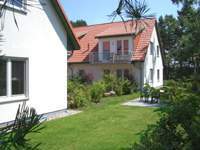 A tidy beach road leads you either directly to the idyllic fishing village of Loddin with it’s thatched houses or to the coastal resort of Kölpinsee directly located at the beach of the Baltic Sea. When the daylight becomes shorter and also on cloudy days, it is especially important to be staying in a spacious, comfortable and cosy holiday apartment. The ground floor apartment offers enough room, a comfortable environment with tasteful fixtures adding to the atmosphere and a patio surrounded by colourful hedges. The seaside resort of Kölpinsee/ Loddin located in the middle of the Baltic sea coast of the island Usedom is perfect for exploring the many places of interest. Whether it be the Usedomer “Corner” or the Peenemünder “hook”, that you want to visit both all are within short distances. Backwater and Baltic Sea are separated by only a few kilometres of land at this, the narrowest part of the island Usedom. Wherever your feet take you, you will always be in the vicinity of the most charming coastal landscape. Through the hill range at Wilhelmshöhe-Galgenberg-Loddiner Höft and the backwater arm Melle you’ll experience a diverse and beautiful landscape.